Happy 4th, good people of the world! I love ya. 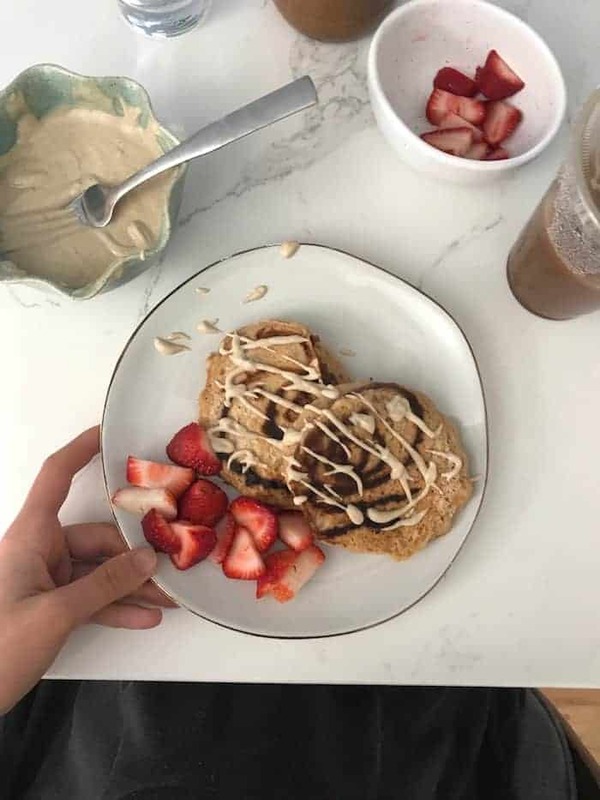 The most epic fluffy whole wheat pancakes with a mixture of almond butter, maple syrup, and cinnamon swirled in! I made a cashew sauce drizzle with cashews, maple syrup, water, lemon juice, and vanilla. Also, you don’t see pics of coffee in these posts but know that I drink java daily! We get organic beans from Costco and I grind them in the Nutribullet. 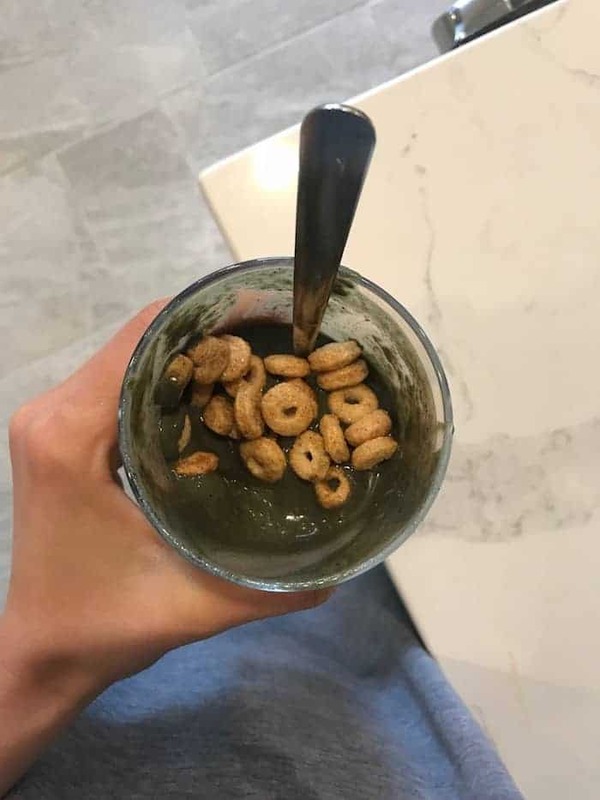 A big smoothie with Wyman’s cherry berry and kale mix, frozen spinach, avocado, cacao, hemp seeds, vanilla spirulina plant protein, and almond milk with Kashi cinnamon hearts on top for crunch. 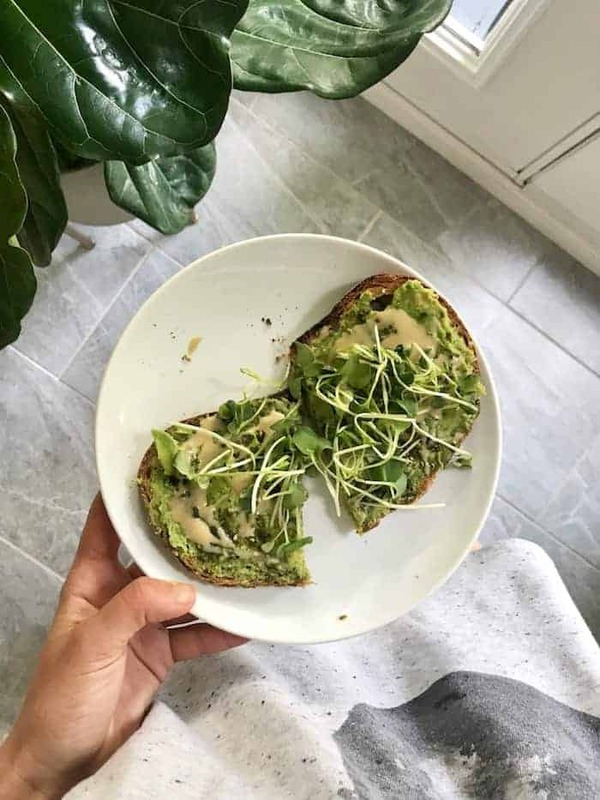 Ancient grain sourdough toast with avocado, tahini, za’atar, salt, lemon juice, and micro greens from our CSA. Be sure to enter to win a FREE box if you live in Cbus! 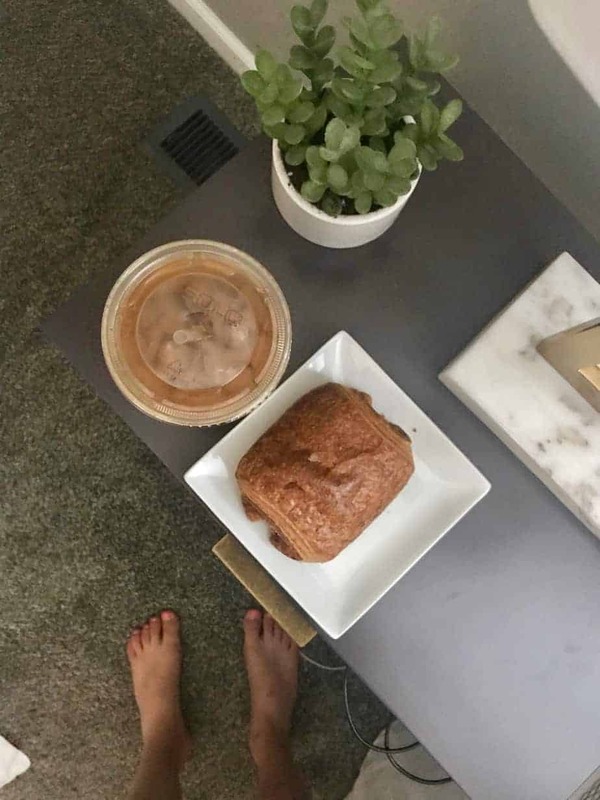 Last Saturday Jeff brought my my favorite Pistacia Vera + iced coffee with almond milk in bed before a sweaty Body Pump workout! What a treat. 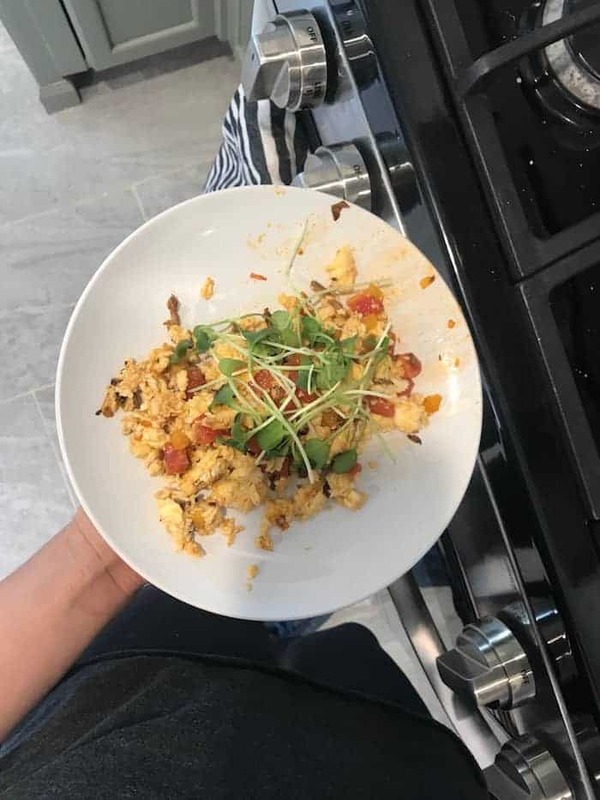 I came home and made scrambled eggs with veggies and micro greens. 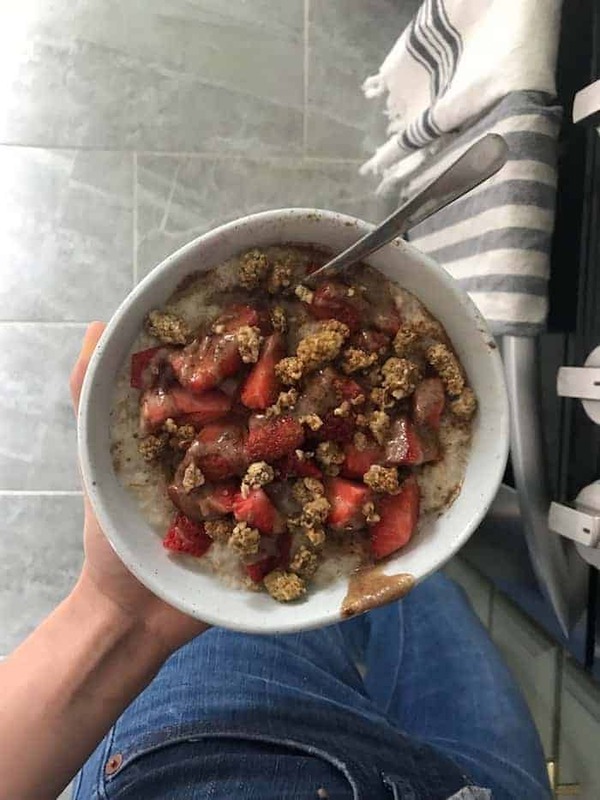 Steel cut oatmeal with date pecan butter, mulberries, strawberries, and cinnamon. 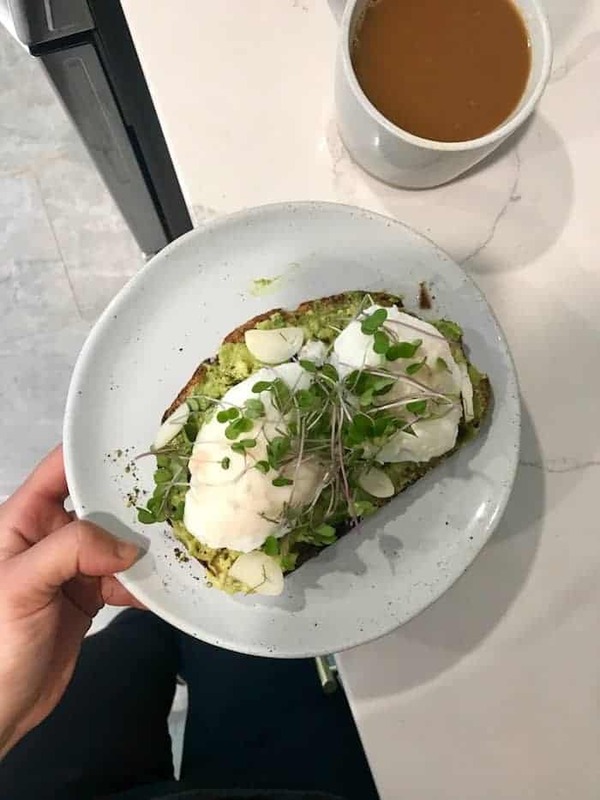 More avocado toast with two poached eggs and micro kale. I added garlic slices from our favorite Grillo’s pickles and it took it to the next level. Beet Benny last Sunday with some pals before we grabbed beers at Brew Dog. 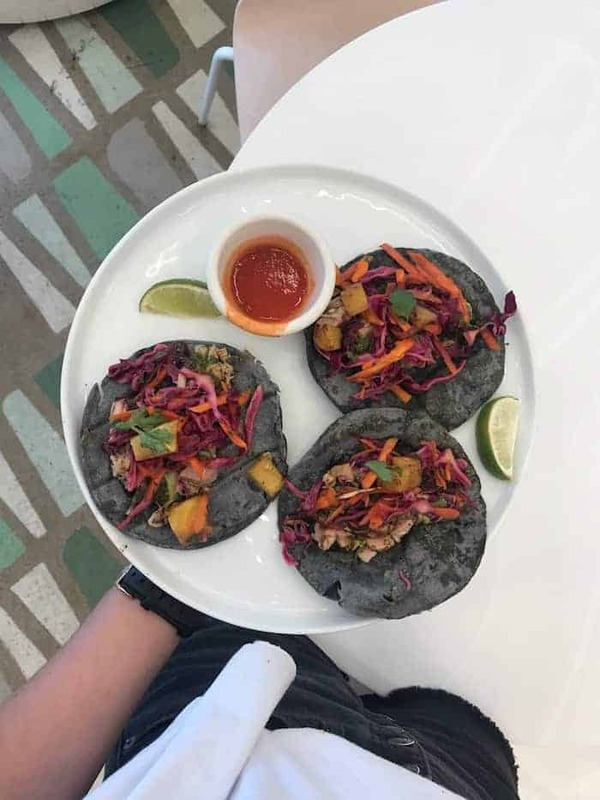 Jakcfruit tacos on blue corn tortillas with carrot cabbage slaw, charred pineapple, avocado, and hot sauce. 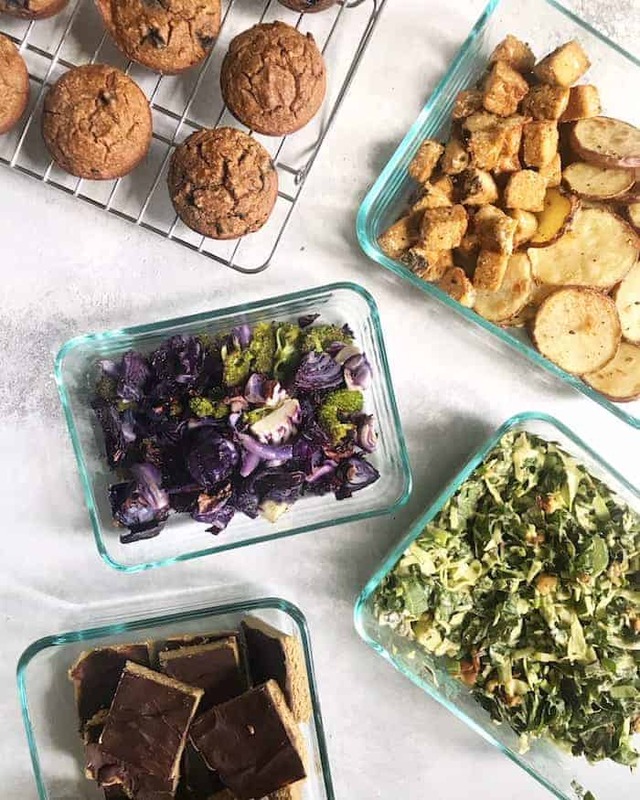 I meal prepped a bunch of tempeh, potatoes, broccoli, and purple cabbage (all roasted at 400F with avocado oil, salt, pepper, and garlic till browned). Then I made a modified version of my Israeli Power Salad with chard, cabbage, green onions, cucumber, fresh thyme, tahini, lemon juice, salt, pepper, garlic, and za’atar. It’s the BEST combo and I love that it lasts in the fridge! 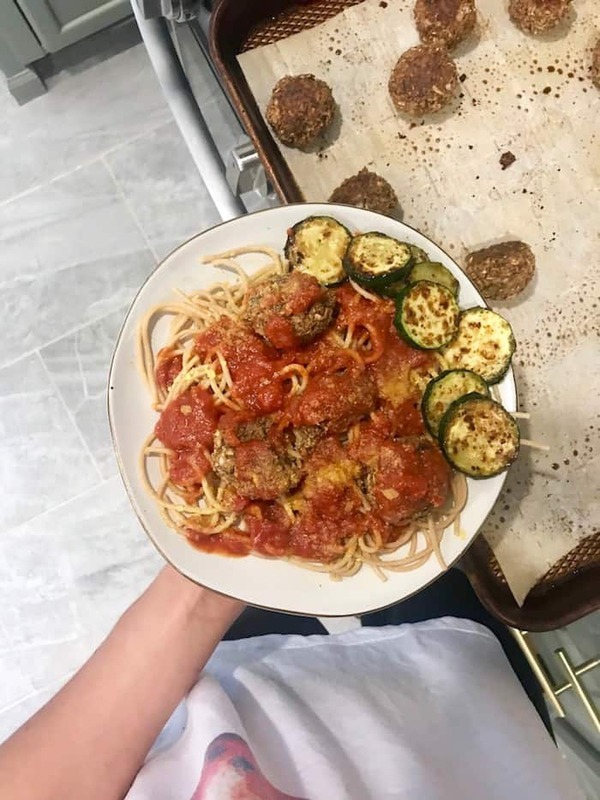 Bean Balls with whole wheat spaghetti, Kirkland’s organic marinara, and pan-fried zucchini. 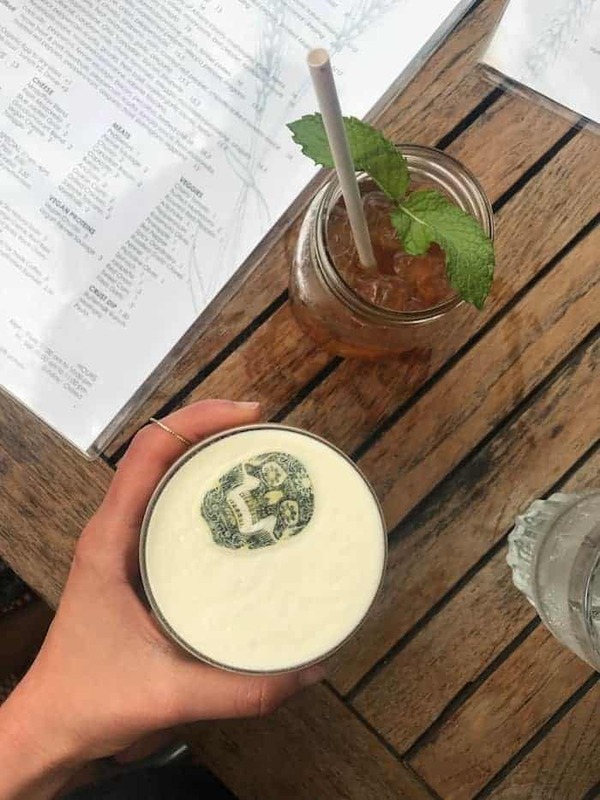 We went to Curio, our favorite cocktail bar, several times last week because it was closing. Tears! 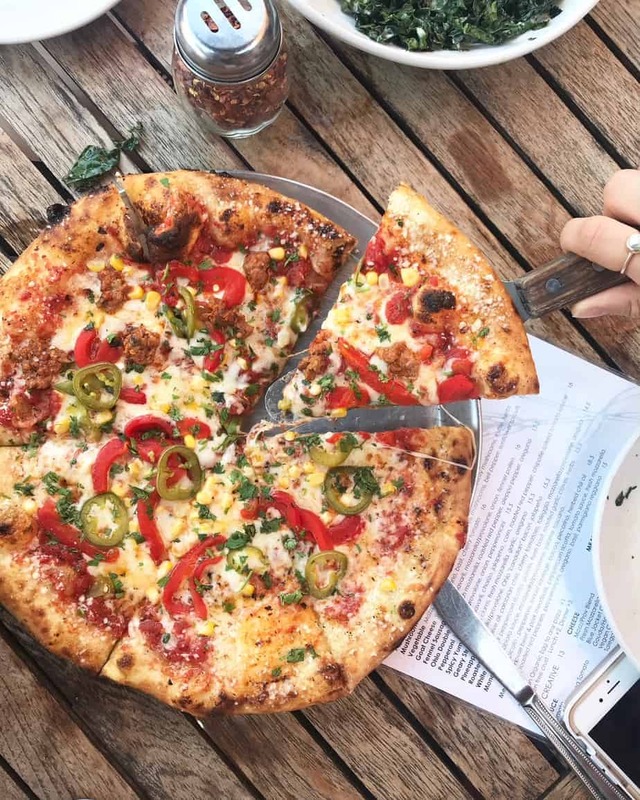 It’s right next to Harvest pizza, so I was lucky enough to enjoy a pie twice last week with different friends. First up is the Spicy Yuma with chipotle spiked tomato sauce, havarti, corn, and jalapeños. 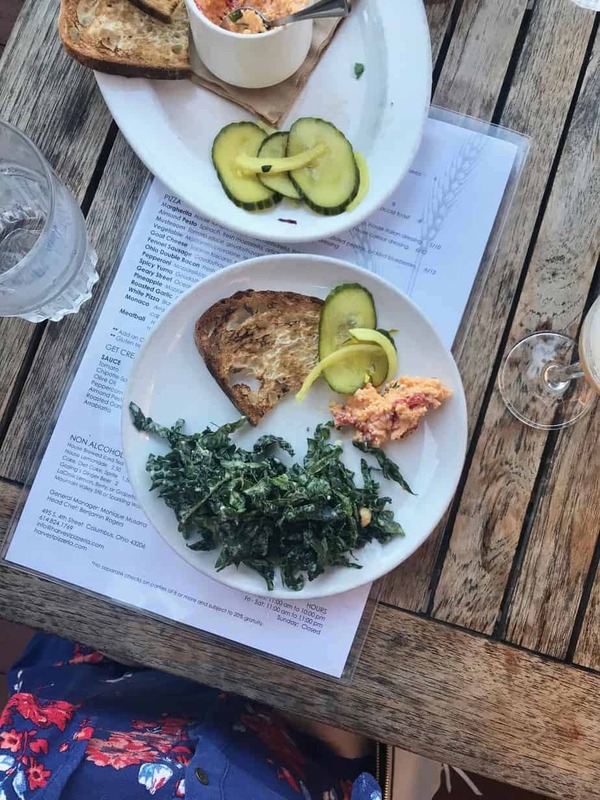 We always get some kind of salad with it (this time was the kale caesar) and either charred shishito peppers or the pimiento cheese dip. Next was the special with arugula pesto, fresh mozzarella, fresh cherries, and greens. 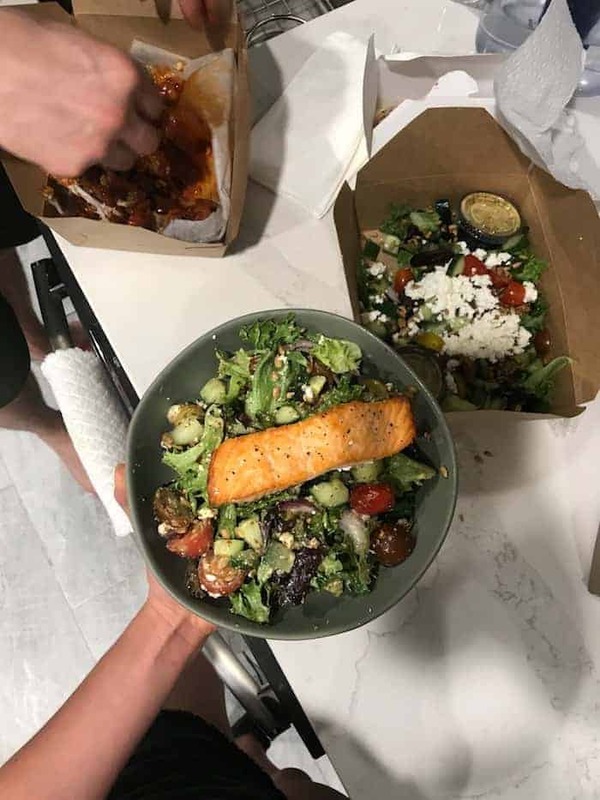 A big salad with greens, tomatoes, cucumber, red onion, Bulgarian feta, and grilled salmon from The Crest. Grilled stuff! We had friends over the fourth so we grilled sweet potatoes, chicken (I ate leftover bean balls), asparagus, and peppers and served it with a big salad made with local greens, tomato, cucumber, avocado, and balsamic vin. For the dressing, I blended up extra virgin olive oil, balsamic vinegar (a bit more oil than vinegar), splash of water, maple syrup, and dijon, salt, pepper, and garlic. So easy and blending it up makes all the difference! I served the grilled stuff with a buffalo yogurt sauce made with Greek yogurt, Frank’s red hot, garlic powder, and salt. For apps, I set out garlic hummus and pretzels, black bean corn salsa, and Shagbark tortilla chips. We also had a big bowl of juicy watermelon. Mushroom tacos, chips and guac, queso, and this lovely salad with arugula, almonds, avocado, apple, mandarin oranges, and radish from Bakersfield. I made Simple Mill’s banana muffin mix with 1 tsp cinnamon, 1 tsp vanilla extract, 1/4 cup ground flaxseed, and 1 cup frozen wild blueberries stirred in. Toast with almond butter, banana, coconut bacon, smoked sea salt, and honey. Cookie Dough Protein Bars! I forgot how amazing these are right outta the freezer. Have you tried the new watermelon kombucha? So fun! A big smoothie with blueberries, cherries, cinnamon, avocado, hemp seeds, spirulina, spinach, and chocolate plant protein. I made this Simple Oat and Pecan Blueberry Crisp with frozen wild blueberries for the fourth and it was so delish with vanilla ice cream! Chocolate covered strawberries are the easiest treat ever. Simply melt a bowl of chocolate chips in 20 second increments until melted. Dip washed and dried strawberries in the chocolate and place on a plate lined with parchment paper. Freeze until set and eat. 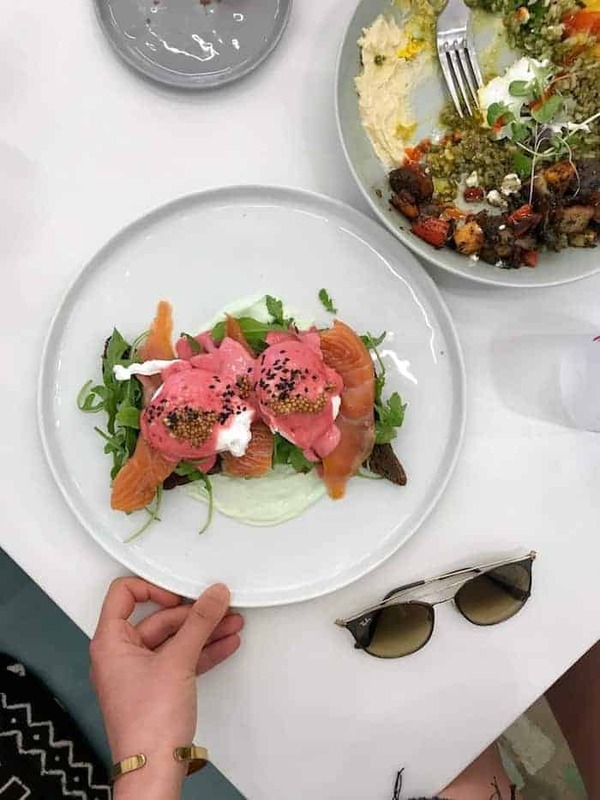 Loving these summer eats! 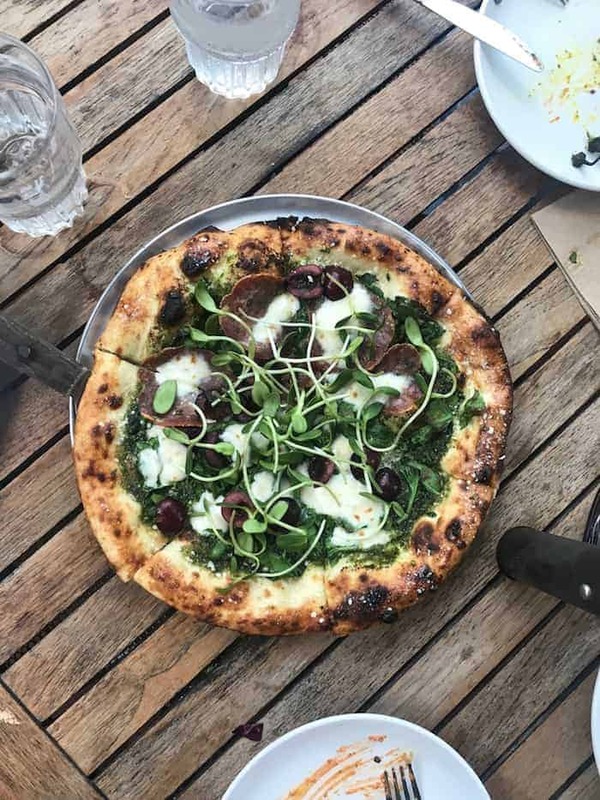 That special pizza with cherries sounds like perfection. Simple Mills banana muffins are so tasty and adding wild bluebs is brilliant. Oh, and thanks for the head’s up about the watermelon kombucha – must try! I love chocolate covered strawberries…why don’t I try making them myself?! I’ve been enjoying making a simple homemade 3-ingredient chocolate sauce (coconut oil, maple syrup, and cacao or cocoa powder)…I think that would be delicious over strawberries! Yum to everythang!! Your snacks give me life. Everything looks fantastic! Your cashew drizzle game is fire. ;) I really want to make those Simple Mills muffins soon, and your spaghetti looks so comforting and delicious! Hi! I have been looking for a protein powder with spirulina and chorella. do you like the flavor of the one you tagged in this post? Hi! I have been looking for a protein powder with spirulina in it. do you like the flavor of this one? Ya I love the taste! Never wanted eggs benny?! Girl it’s SO good!! Highly recommend.